Synopsis: From a vantage point of a stone cell, other stone cells wrap around from the right all the way around to the left; below, more floors of cells and the Perspective; above, more floors of cells and the Perspective. The world within the Sausage Universe is all the inhabitants know—the stone walls belong to them and the vast space between the cells belongs to the passing sun, moon, and the comical Gods upon the cloud. With no knowledge of their history or of their destiny, myths are abound and hope clings to mere whims. Pre-analysis: Some people never leave their country, state, or town as they’re content with what they have, what they see, and who they are. Anyplace could be the setting for someone with such a narrow perspective. Regardless of the internal comings and goings, regardless of all the news from afar, regardless of the crazy transients, the so-called content seem to be more deprived than happy. Do caged birds sing because they miss the freedom of flight, or it is a voice of deprivation? Analysis: When the world you have always known as an insular and hermitic as the Sausage Universe, there is very little to ignite curiosity. Through the shared come the Sun, the Moon, and the only oddity in an otherwise odd universe: The Celestial Family upon the Cloud with it mechanical comedy. But none of this is odd because it’s all they now between the walls of their lives—the physical confines of their universe. Imagination has only two directions, which might as well be the same direction because they offer the same perspective: up and down. Those who venture the climb are none the wiser. The conclusion offers a fatalistic result of being confined to a closed system: a slow decay where the very core consumes itself. As the body itself cannot survive on sunlight alone, not can the Sausage Universe survive on repetition alone. Knowledge of its extremes simply limits its possibility of infinity, progressively making it more like a closed system than ever before; names and numbers only reinforce its confines. Pre-analysis: I remember when I was young—around 13 or 14—when I tried an experiment. While looking at strangers passing by, I tried to think of my father as a stranger: What if he were just another face? What would he look like? Would he look like Dad? To my astonishment, I was able to see his face as not my father’s. I remember a warm wave of reality like a tide rush over my mind, yet without the foam of uncertainty… only the wet settling of experience. It’s hard to put into words as it was an absolutely jarring moment that I’ve never been able to verbalize, but since then, it has put so many thoughts about perception in my mind: objectiveness, aesthetics, and love among them. As a science fiction reader, many parallels of the same theme have crossed my mind: What if I see myself on the street? What if I wake up next to myself? What if I had an hour to spend with my exact twin? What if see my female counterpart? All are variations of impossible speculation, yet the shadow of the thought remains. Thankfully, speculative fiction addresses these same questions in different lights, yet they all share the same form of shadow: What would happen when confronted with my counterpart? Aside: The synopsis skirts the narrator’s gender as it’s unmentioned in the story. So, for the sake simplicity, I will assign the male gender (though any would be equally as valid). Analysis: The narrator stands on a fulcrum between two counterweights: himself as functionally human (in the bathroom, as human nature has intended) and himself as conceptually human (in the cockpit, as human society has dictated). As he faces the impossibility of confronting himself, which form of self will continue to exist and which will vanish from reality? According to Schrödinger’s experiment, there’s a 50% chance that either will occur… but what if, when confronted with the actual situation of confronting one’s own doppelganger, that subconscious impetus could push probability beyond the precipitous bell curve? When the conscious choice must be made, would you identify yourself as a flesh-and-bone human prone to error and luck, or would you identify yourself as role-and-command pilot adaptive to pitch and speed? Synopsis: Higashikoji Kojiro wrote a symphony once, but it took him eighty-three years of relentless copying from the music in his mind. It filled over one hundred warehouses and only began to see the light when Ujihara Tamotsu urged that the symphony be played in its entirety, which may last as long as ten thousand years. A mountaintop amphitheater was constructed and the eight daily orchestras have been playing for over a hundred years without pause. Now, the 800-Person Movement approaches but no one is quite ready for it. Pre-analysis: Most people can’t draw, paint, sing, or write worth a damn; their creativity is limited to making lines at the Apple store during a product launch. Not all of us can be gifted in any of the arts (while I love to write, I don’t have the time, patience, or talent). There are a few things I love and would love to be included in organizing a event for any of them: running, craft beer, science fiction, and teaching. If I were to organize an event for any of those, I would feel privileged to work among other fans/aficionados/professionals toward making an event we would be proud of. We’ve all probably even volunteer and end up losing a bit of our own money just for the sake of doing it right. Then there are those events that are organized by others, like a 5km race organized by bureaucratic university heads or a local craft beer festival organized by an art gallery (speaking from my experience in August, actually). How can you fluff up something as simple as serving beer? The love obviously wasn’t there; more likely, the all-holy dollar signs (or, here, the basking radiance of the baht) influenced their every move. Analysis: Be it solos or ensembles, the musicians of the neatly-infinite symphony all know their parts. Each cherishes their part with their very heart, reveling in the sense of community (with fellow musicians) and the project (with time, itself). However, due to their level of direct involvement, they don’t have the necessary time to organize themselves on the more general level, like preparing for the mass ensemble. Along each of the bureaucratic steps toward achieving the ensemble, their progress is snared because of human error (the transcriptions), human limitations (the 800-shaku instrument), or human indecisiveness (the amphitheater). As each of these parts was not headed by musicians that were directly involved in the playing of the symphony, each part resulted in it being fuddled one way or another. While the playing of the music is a well-polished clock face, the scene behind the music is a tumult of springs and gears, each with an increasing fallacy of what we call human error. The 10,000-year symphony could very well be completed by immortal human musicians, but the only snare in their plot is the organization, an organization by outsiders likely to throw a spanner into the gear works. Synopsis: Aboard the Gurkha 107, Ozaki is just a lackey with a few of the other crew. When they get a call to intercept a fast-traveling object in the Sirius system, they discover the Basilisk, last seen in the year 2100. The mystery is how it came all the way to Sirius with its weak propulsion. As a lackey, Ozaki is volunteered to investigate the ship’s interior, where he finds a log. In this log, the ship’s demise during the war is chronicled as well as the captain’s bizarre experience outside of Sol’s system. 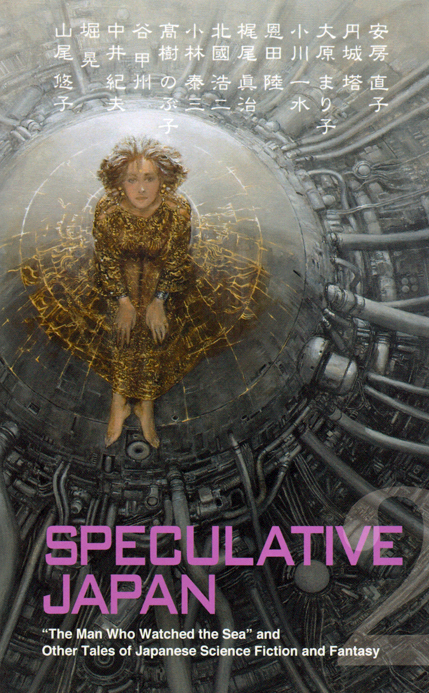 Pre-analysis: This is a hard-SF story that offers to simply tell its story in the most direct manner possible; while it may have the least overtones of emotion, theme, or moral, it does contain some elements that I identify as intrinsically Japanese. Usually, an overarching theme is obvious or subtle, yet it tends to percolate eventually. With “Q-Cruiser Basilisk”, I had to dig a few layers deep to find an appreciable theme and the one which I found is as noble as the others. Analysis: As mentioned in the synopsis, Ozaki is just a simple lackey on the ship. When the ship approaches the mysterious derelict of Basilisk, the skipper—Ming—sends his lackey into the face of danger while he’s safely secured in his own ship. Ozaki knows his lowly place and so ventures into the dislocated and ancient craft to find about its origins. This is Ozaki’s story, but within the ghost ship of Basilisk, he finds another story. A ghost ship, like the Flying Dutchman or the Basilisk, is a relic of the past. It’s an island into itself, a separated body untouched by the recent past. While some ghost ships are mere days, weeks, or months old, the Basilisk is an ancient relic some-150 years old. Its physicality is a relic, but so are the cultural norms that it used to carry with its living crew. The story that surfaces from a document found by Ozaki highlights that key cultural norms have changed in regards to hierarchical obligation. Nils Hellner was the last survivor of his ship, he the Master and Commander. Early in his crew’s campaign to avoid capture, Nils had the judgment call to escape straight out into open space with suspended hope for rescue; sadly, for the crew, the judgment was flawed and their hopes quashed. As their hopelessness persists, they realize they need to maintain focus, so they continue to shoulder the yoke of duty as they stay busy taking measurements of space with various instruments. Eventually, they also realize that their individual lives mean very little and that their collective continuance must endure; therefore, sacrifices must be made. As Nils has relieved their crew of official duty, they make decisions based on honor rather than duty. By ones and twos, the crew off themselves through the airlock leaving Nils the singular soul on board; the remaining oxygen, provisions, and space are all his. With his enduring solitary life, the crew invested the shared hope for their story to be known. As Ozaki finishes reading the Basilisk’s tale of heroism and sacrifice, the skipped of his own ship yanks them from their duty. They must abandon the derelict ship, forever leaving its story and solitary crew to drift through open naked space, its story never told, its sacrifices never shared. Instead of respecting the noble crew and their sacrificial efforts, Ozaki’s skipper decides to cut loose and fly off toward another emergency, one that reeks of self-interest, convenience, and egoism. Synopsis: The Melk Abbey has a long and rich history amid the vineyard it’s surrounded by, yet it’s the library that holds the abbey’s true historical wealth in the centuries’ old documents and frescoes. Also, there’s an emotional element with the placement of the window and the security of the rhombus of sunlight as the only sense of warmth. Seeing a red vase in the fresco, a visitor is made aware of a woman standing behind the same vase. The old man spins a story of having the woman as his wife and growing a vineyard together. Pre-analysis: Thailand is a place studded with ancient history with its well-manicured temples from days of yore—stoic monoliths of erect stone and receding mazes of ruddy rock. Walking amid the temples, upon the stairs, across the lawn, and through the doorways, one can’t help but think of who inhabited this plain—What lives did they lead? What sorrows had they experienced? What joys did they share?—and how it affected the city. The all the people have passed away from this once great city, do their emotions still course through the porous rock? Surely, any region on this earth can offer a similar experience, such as the German abbey in “Melk’s Golden Acres”. Analysis: An idle mind can create a focus for its stirring prowess; these objects of focus can become idols or obsessions. As minutes whittle away, so too do the hours, days, and years, the focus of the mind makes this object a center point of its existence. If intangible emotion can be imprinted into something tangible, surely the age-long fixation of an idle mind could effuse the sensation into the very walls, the very fresco that had held its attention for so long. Could it effuse so much of its own vitality to imbue volition upon the once static image? It would take a rather fragile mind or an incredible mind to believe that its object of obsession had come to life.